Polycom's SoundStation 2W has many unique features which let you set up a conference anywhere - even in places with no phone lines! 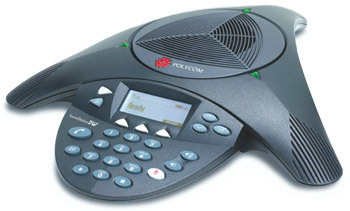 Building upon the great sound quality of the original SoundStation, this new SoundStation2W audio conferencing telephone unit incorporates 2.4 GHz technology with voice encryption, features up to 24 hours of talk time and the unique ability to set up a conference call through a cellular phone connection. The Polycom SoundStation 2W is the new standard for anytime, anywhere audio conferencing! Acoustic Clarity Technology - Polycom's market-leading technology, which offers crisp voice quality and full duplex communication. The SoundStation 2W features high-performance speakers and finely tuned microphones that offer 360-degree room coverage. With these features, the SoundStation 2W provides twice the loudness and twice the microphone sensitivity of its predecessor. Proven & Secure Wireless Transmission - The SoundStation 2W wireless transmission is based on the proven and secure 2.4GHz platform and uses digital spread spectrum and 64-bit encryption technology to keep conversations private. Other security features include an authentication key between the console and base station to ensure the correct base is being used with the appropriate console. Audio outputs for recording are also located on the console, which reduces the likelihood of unauthorized recording of conversations. Freedom & Unparalleled Flexibility - The phone can operate up to 150 feet away from the compact base station which plugs into any analog phone jack. Unparalleled Flexibility - If you have a power source and cell phone service, you can set up a conference call using the SoundStation 2W even when there is no regular phone service. Start a call on your cellular phone and then connect it to the SoundStation 2W via a standard 2.5 mm cable. Working in a larger meeting area? No problem. Just add external microphones and speakers to the SoundStation 2W and keep everyone involved (available on the EX model only). Long Lasting Battery - A fast-charging lithium-ion battery offers 12 or 24 hours of talk time (with a battery upgrade) and 80 or 160 hours of standby time. A weekly charge will often be enough to provide 24 hours of talk time. This gives you the freedom to set up a remote conference call anywhere. Investment Protection - With an integrated USB port, new features and functions can easily be added to the SoundStation 2W by a simple software download.